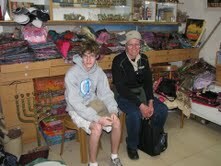 This past Thursday Brad and I drove Jacob to JFK and put him on a plane to Israel to see his grandparents. I couldn’t help but compare this experience to one probably five years ago when Brad and I put both Jacob and Anna on a plane to see both sets of grandparents for two weeks during the summer. Of course, both of them were much younger. I think Anna had just finished third grade and Jacob had finished fifth grade. I don’t know who was more nervous—the kids or Brad and I. Jacob and Anna had flown before so they were familiar with some of the routines of flying. Nonetheless, when they finally landed in Chicago according to both grandmas, they stumbled off the plane, looked rather green around the gills, Jacob threw up in the nearest airport trash can, and Anna was in tears. Oh my! Apparently the flight was rough and the boy sitting next to them was airsick. A combination of nerves, vomit, and a bumpy flight made for a difficult “welcome to two weeks with your grandparents!” If they didn’t have to get back on a plane, they might have wanted to come home! We all laugh about the trip now and the kids had a wonderful time with their grandparents and cousins. Contrast that to this past Thursday night: a mostly silent teenage boy, independent, and certainly not professing any nervousness whatsoever. For Jacob, the week leading up to his trip was quite busy. He had his first track meet, a Latin test, and a Humanities paper to finish so I don’t think until we were actually driving to the airport did the full impact of his leaving hit him. Unfortunately, only one parent could walk with him to his gate because of security restrictions so I was the one to go with him. I was probably repeating some of the same instructions I had told him before, “Once you land the walk to Passport Control is a long way off” and “don’t lose your passport.” I’m sure he was more than ready to board the plane and not have his chatty mother with him. I did get a hug, a kiss, and “I love you” before he rounded the corner to go through Customs before boarding his plane. I stood watching him for a few moments as he followed the lead of the others around him, putting his bag in the plastic carton, and handing over his passport to the Custom’s official. I also got a few smiles and a wave before he was out of my sight. I was keenly aware that this is the direction our relationship is headed more and more—letting him go as he navigates life on his own. It’s good and sad all mixed together. Jacob arrived safely the next day and his grandparents were waiting for him in the designated spot. He sent us a short email saying the flight went well, and my mom has kept us up-to-date on their activities. He enjoyed his first falafel yesterday in the Old City. So while I miss him, I am also glad he has this opportunity, and he better be more talkative on the way home! How exciting for Jacob and for YOU as you have raised him well to embrace independence, he is ready! Thanks for sharing Alicia.